I never did get me meet Mr. Max Sturman who was obviously a promoter of good health and nutrition – although I have been in contact with his son Andy who actually lives less than a couple of blocks away from me here in sunny San Diego. 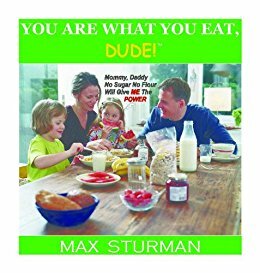 Max wrote many books on the subject of healthy eating and I happened to stumble across You Are What You Eat, Dude! in the local Carmel Valley branch of the San Diego library. Lot’s of great information in this book – it was published by the author’s Do It Naturally Foundation (now defunct) in 2009 when he was 90 years old. It’s too bad that the work of the foundation won’t be carried on. Some of Max Sturman’s other books include: No Sugar No Flour Will Give Me The Power, Never Get a Cold (illustrated by Jose Gonzales Jr) and OBESITY: The Solution.